How do I customize the URL for a published blog post? When you create a blog post, its friendly URL reflecting the post's title will be created automatically. Although you can customize this URL when first creating your post, you can also customize it at any time by simply editing your blog post. 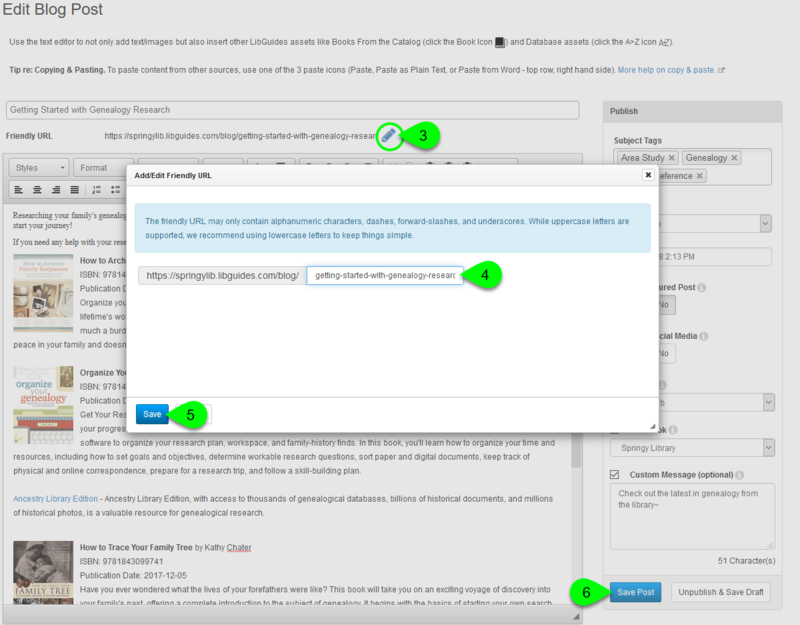 To customize the URL for a system blog post, go to Content > Blog. If this is for a guide blog, however, edit that guide and click its the blog page. The URL for each post will display under its title. To edit a post's URL, click on its cog () button and select Edit from the dropdown. On the Edit Blog Post page, you'll find the Friendly URL underneath the post title. Click on the pencil () icon to edit it. In the Add/Edit Friendly URL window, make your changes in the text field. Friendly URLs can contain only letters, numbers, dashes, forward slashes, and underscores. Although uppercase letters are supported, for best results we recommend using only lowercase letters. In the Publish box, click on the Save Post button.